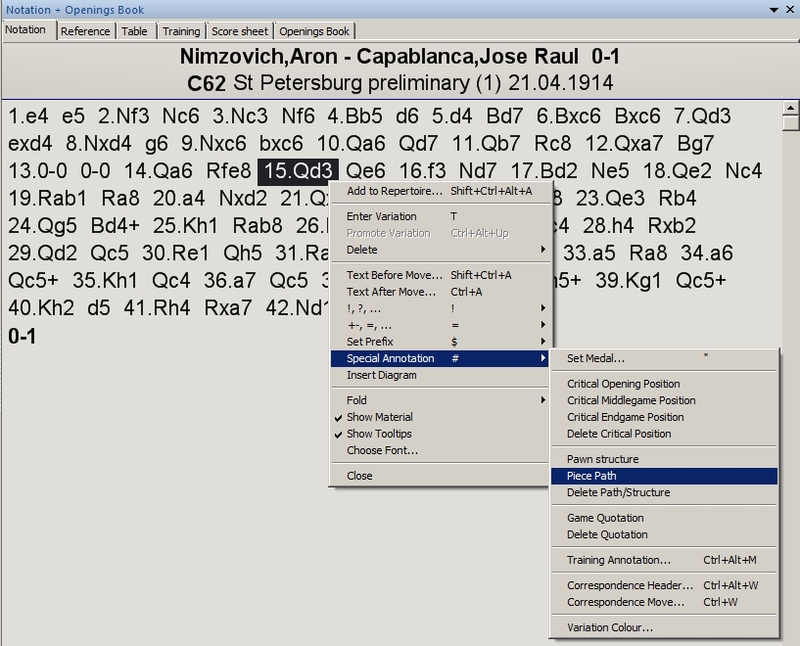 I’ve recently been editing some pre-1930 chess games for publication and came across this interesting one from the 1914 St. Petersburg tournament. It involves an unusual amount of Queen maneuvering, which will also give me an opportunity to demonstrate one of the special visual annotation forms available to ChessBase 11 users. If you’ll play through these moves, you’ll notice that Nizmo has moved his Queen a lot: six of White’s first fifteen moves have been with his Queen. The result is that Black has developed his whole army, while White has pieces which are still untouched on his first rank. This is pretty significant (as illustrated in Capablanca’s notes to this game, in which he emphasizes the number of times the Queen has moved). Now let’s say that I’m writing some notes to this game for my own benefit (and, by the way, annotating master games is great practice for the developing player and has been recommended by chess instructors for many years now). I could (and should) make a text note pointing out the “lively” (e.g. 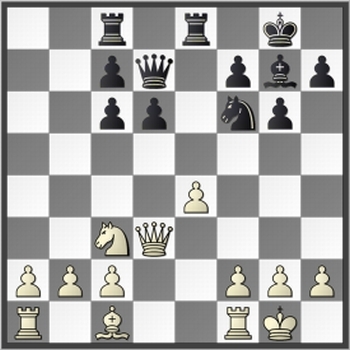 numerous) movements of the White Queen. But there’s a second annotation form I can use which will visually illustrate the same point; it’s called the “piece path” annotation. This box indicates that the “Piece path” special annotation has been appended to this move. But what the heck is the “Piece path” annotation, anyway? “Piece path”, as mentioned earlier, is a means of calling a reader’s attention to the number of times a particular piece has moved (or the specific squares to which it moved) in a visual way. 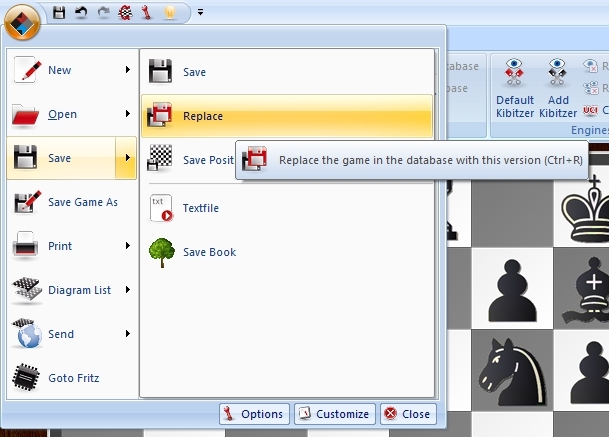 When you (or another reader) either encounter that move while replaying a game or click directly on that move, a special “inset” chess board appears. This board contains colored arrows which show every move of that piece from the start of the game onward. It’s one thing to write a verbal comment to the effect that Nimzo has frequently moved his Queen, but it’s quite another to actually see the Queen’s path graphically illustrated (for impact, emphasis, and instructional purposes) as we see in the above illustration. The ability to see the piece’s path across the board, shown by numerous arrows, can really drive a point home. To “clear” the piece path inset board (that is, remove it from view), just click on it with either mouse button. The inset board will reappear anytime the move in question is clicked on or encountered during a game replay. 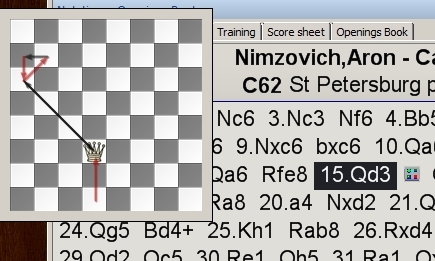 The “piece path” annotation form is useful in a wide variety of chess situations, including very common ones (such as illustrating the King’s movement toward the center in a late middlegame or endgame) and less-common occurrences (such as a a-pawn which, though repeated captures, makes its way over to the c- or d-file). While it’s not an annotation tool you’ll necessarily use every day, the ChessBase 11 “Piece path” visual notation is handy to know for those special instances when an additional chessboard graphic will really help to emphasize a point or principle.